My family’s favorite quick and easy summer salad is a fresh caprese salad. Made with perfectly ripened tomatoes from our garden or a local farmers market, pungent basil snipped from our herb garden just outside the back door, soft fresh mozzarella, and a drizzle of olive oil and irresistible balsamic vinegar…and, wow, we’re quite the smitten bunch. And I just love that it’s a dish that our young girls ask to help out with in the kitchen. I do hope you’ll hop on over to the 2013 Galbani Caprese Challenge to vote for my recipe! Thank you so much! 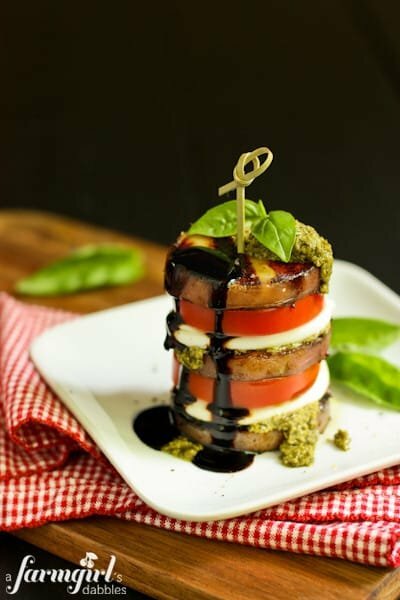 These Caprese Stacks with Grilled Honey Balsamic Potatoes promise to be the hit at your next summer get together. Just the sight of them, stacked with layers of gorgeous color and texture, makes your eyes do a double-take. Blake and I especially loved the flavor and texture that the grilled red potatoes brought to this classic salad. 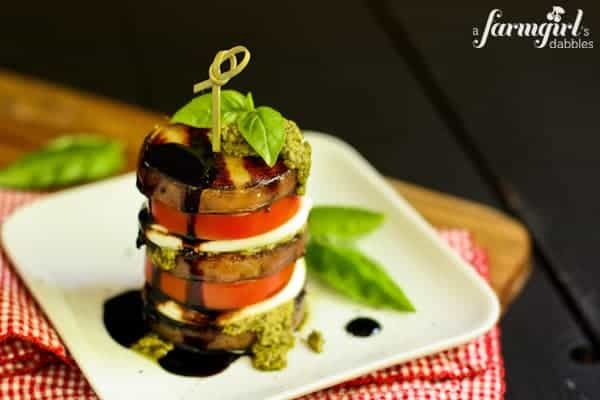 Tender on the inside and perfectly charred on the outside, with a sweet and tangy bite, they are a sublime addition to the caprese. And our girls loved…well, they just plain loved it all! From the melt-in-your mouth Galbani Fresh Mozzarella, to the flavorful potatoes and sweet tomatoes, smeared with garlicky pesto and drizzled with a rich syrupy balsamic glaze, they were completely sold. Galbani sent me a variety of their fresh mozzarella to enjoy with my family. Their cheese is crafted from cow’s milk right here in the United States, using Egido Galbani’s original secret family recipe, a tradition that started in Italy over 125 years ago. Recently listed by the editors of Saveur Magazine as one of their favorite fresh mozzarellas, we found it to be delightful as well. It’s soft and moist, with a mild and delicate taste. We enjoyed Galbani Fresh Mozzarella melted on homemade pizza, folded into fluffy scrambled eggs with fresh herbs, and layered in grilled sandwiches for an ooey gooey lunch. It was the star of a great pasta salad with sun-dried tomatoes, and the marinated ciliegine (little balls of mozzarella) were oh so fun to pop in our mouths as we waited for our meal to come off the grill one evening. Boil potatoes just until tender throughout, about 12 minutes or so. Drain and let cool for 20 to 30 minutes. Slice potatoes into 1/4” rounds. You will need 18 rounds for this recipe. Heat grill pan over medium-high heat. Spray pan with non-stick cooking spray. You could also use an outdoor grill for this part, using the same medium-high heat. In a small bowl, whisk together honey and balsamic vinegar. Dip potato rounds into honey balsamic mixture and place on hot grill pan. Sprinkle potatoes with a bit of kosher salt and freshly ground black pepper, to taste. Grill for 2 to 3 minutes, or until potatoes have beautiful golden grill marks. Then flip the potatoes and grill for another 2 to 3 minutes, or until golden grill marks are achieved again. Remove grill pan from heat. To assemble, place a grilled potato round on a small plate (for individual servings) or a large platter (for serving family style). Top with a rounded teaspoon, more or less to taste, of pesto, spreading it out across the potato round. Place a mozzarella medallion on top of the the pesto, followed by a tomato slice. Repeat the stacking with another layer…potato, pesto, mozzarella, tomato. And then top with a third grilled potato slice and a bit of pesto. Press a skewer or pick (mine were about 4” long) down through the center of the stack to stabilize. 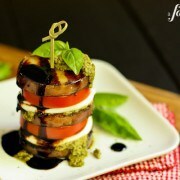 Drizzle a bit of balsamic glaze over the top, letting it run down the sides of the caprese stack. If desired, top with a basil leaf for garnish, and sprinkle with additional salt and pepper. Note: I used a balsamic glaze that I found at the grocery store. But you can substitute with a simple homemade sweet balsamic reduction. In a small saucepan, bring 1 cup balsamic vinegar to a boil. Reduce heat to medium/medium-high and cook until the vinegar is thickened (like a thin maple syrup), about 10 minutes. Remove pan from heat and stir in 2 tablespoons of honey. Let cool completely. The glaze will thicken a bit more as it cools. 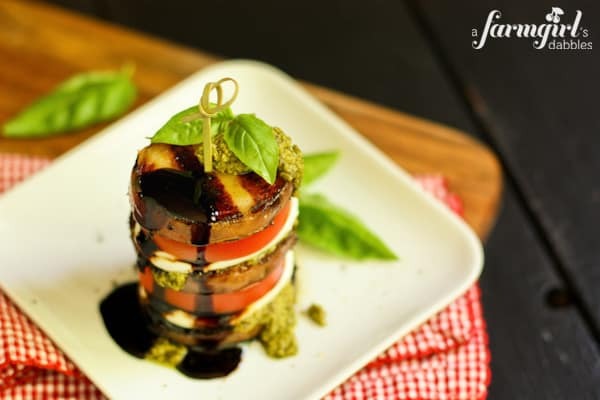 This glaze can be made ahead of time and refrigerated, just let it come to room temperature while you prepare the caprese stacks. And now it’s time for you to vote! 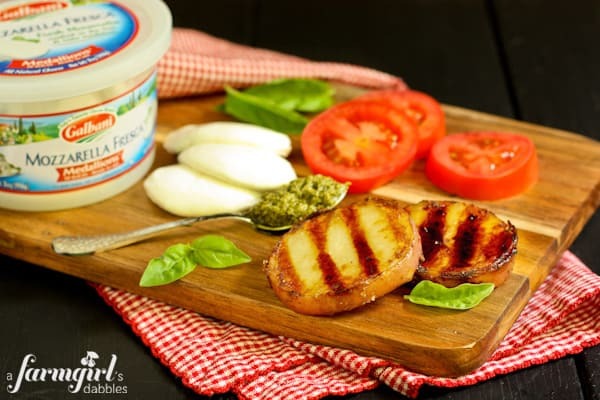 Please head over to the 2013 Galbani Caprese Challenge to vote for my Caprese Stacks with Grilled Honey Balsamic Potatoes. Be sure to vote often for your chance to win weekly prizes and a GRAND PRIZE OF $500! I would greatly appreciate your vote, THANK YOU so much! Please look for Galbani Fresh Mozzarella in the specialty cheese section. Check out their store locator at www.GalbaniCheese.com to find the grocery store nearest you. Disclosure: This post was sponsored by Galbani and Blogher. All opinions expressed are my own. To read the full disclosure of this site, please go here.